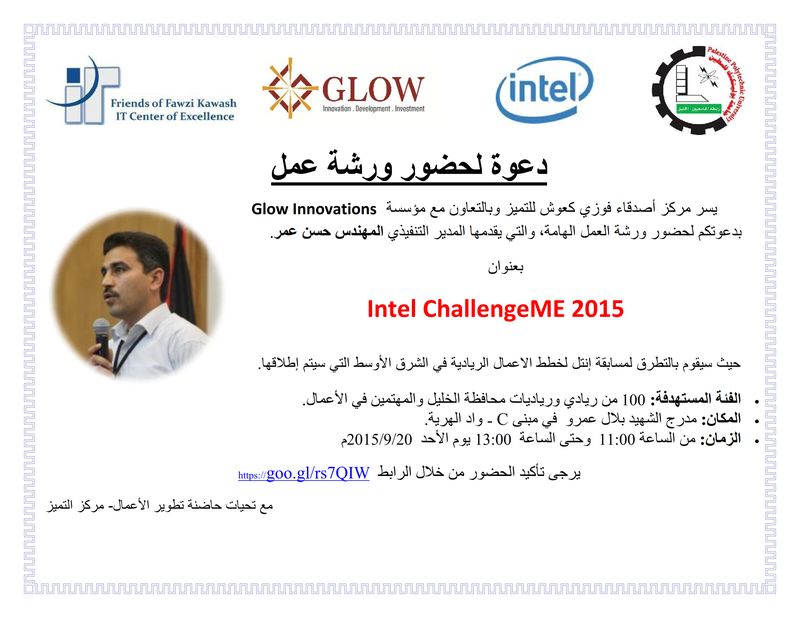 Invitation to Participate in "Intel Challenge Me (2015)" Workshop organized by "Glow Innovations" in Cooperation with "Friends of Fawzi Ka'wash IT Center of Excellence", and will take place on Sunday 20th September at PPU - Wadi Alhariyyah Campus, Building (C), between (11:00 - 01:00). The workshop will be moderated by "Eng. Hassan Omar" the CEO of Glow Innovations. For confirmation; Kindly PRESS HERE. For more information in English; Kindly PRESS HERE. For more information in Arabic; Kindly PRESS HERE.